Renegade Materials Corporation has a fully equipped Nadcap certified test laboratory and highly trained technicians to perform a variety of tests required by our aerospace customers. Physical, analytical and mechanical testing capabilities support lot-to-lot acceptance testing of our incoming raw materials as well as completed products. 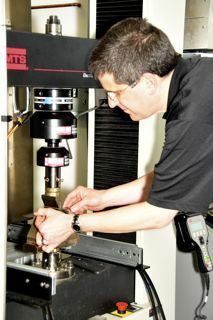 Product development is also a key area supported by our laboratories. At the customer’s discretion, qualification testing may be performed internally or at an accredited testing subcontractor. Renegade’s 30-kp MTS Mechanical Test Frame supports mechanical testing up to 650°F Dry or Wet, using a full range of high-temperature Wyoming Test Fixtures.